Before I begin this review, I have to make mention of how wonderful it is that DC Comics continue to support their digital-first comics with printed issues after the fact for those who may not be inclined to read their comics on their tablet or mobile device. It was only when I sat down to write this review did I come to realize that this series was a digital first on Comixology. Now, with that out of the way, onto the issue itself! Like all comics aimed squarely at younger readers, this issue of Scooby-Doo! Team-Up reads almost exactly like it was taken directly from an episode of the cartoon, but with a few nods to the publisher itself. The story this month is this: Dyno-Mutt is worried about his partner Blue Falcon - it seems that Blue Falcon is acting peculiar lately as he is no longer his happy, go-lucky self, but is now more of a brooding, grittier version of himself. Dyno-Mutt is sure that Blue Falcon is being possessed because of his completely out of character actions. So who does he turn to? Scooby and the gang, of course! It’s obvious from the get go that Fisch has an ease with writing these characters as the story flows and never feels overburdened. The dialogue is quick and snappy, and we can see that sometimes, Scooby and the Gang just need to be observers while their guest stars take the lead within the story. 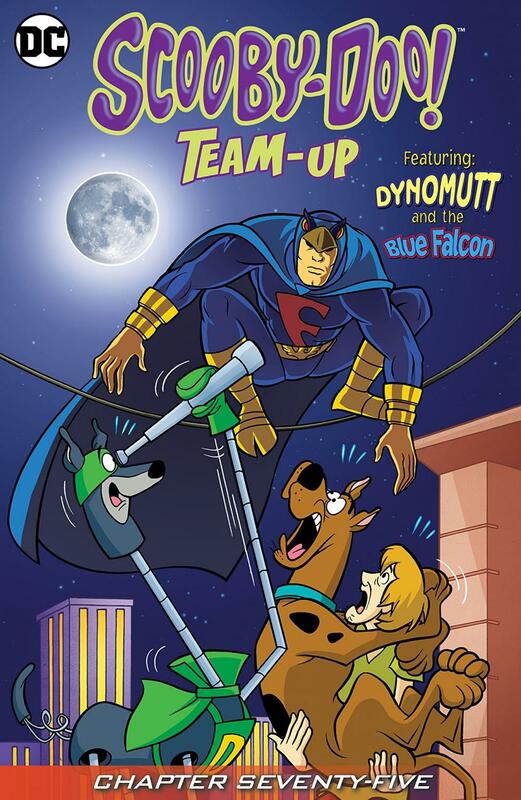 For those unfamiliar with Dyno-Mutt and Blue Falcon (as I was), Fisch makes sure to sprinkle in just enough information for the reader to get to know these characters as the story progresses. Also, there’s a recurring joke where Blue Falcon gets mistaken/compared to a certain Dark Knight that is pretty funny and a sly commentary on that character and his evolution. It’s good stuff. The art team of Carzon, Ottolini, Brys and Temofonte do a fantastic job throughout. Carzon’s panel work helps the story along and is never boring - something that can happen in comics for young readers, and the colour work by Brys is just bright enough to distinguish itself and make sure that the reader can follow the action. Great stuff!